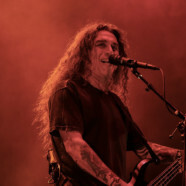 To date, Slayer’s Final World Tour has consisted of Leg One and the just-wrapped Leg Two in North America, with Leg Three taking the band to the UK and Europe from November 1 through to December 8, 2018. The band’s announced itinerary also has them headlining Mexico’s ForceFest on October 7, 2018, and Hellfest Open Air in France on June 23, 2019. Plans are already underway for Slayer to take its Final World Tour to South America, Australia and Japan in 2019. But there will be more, plenty more. 2019 is twelve months long, and the world is a big place. Additional tour Legs will be announced soon. Upcoming announced dates on Slayer’s Final World Tour are listed below.